As he delivered the line on Saturday evening at Santa Fe Opera, the tenor Ben Bliss gestured toward the vast landscape beyond the stage, still visible to the audience as the sun set. And for the first time in the opera’s history, there was no need to suspend disbelief. We were, indeed, right here in the desert where “Doctor Atomic” — a turbulent reflection on J. Robert Oppenheimer and the lead-up to the first test of the bomb developed at Los Alamos, a short drive from Santa Fe — takes place. After its premiere in San Francisco in 2005, a Metropolitan Opera run in 2008, performances all over the world, and the release just weeks ago of a ferocious recording conducted by its composer, John Adams, the work had come home. Superbly performed (it runs through Aug. 16), it struck me as both clearer and stranger than it had when I last saw it, a decade ago in New York. Peter Sellars — who compiled the libretto from a collage of primary sources and poetic texts, and who directed the San Francisco premiere — has returned to “Doctor Atomic” in a spare state of mind. Gone are many of the trappings of that elaborate, 1940s-noirish first production (to say nothing of the positively steroidal Met presentation, staged by Penny Woolcock), including hordes of dancers and a scale replica of the explosive “gadget.” Here in Santa Fe, the costumes are contemporary street clothes, with the youthful physicists looking like engineers at a Silicon Valley start-up; just a handful of dancers thrust and wriggle to Emily Johnson’s choreography. 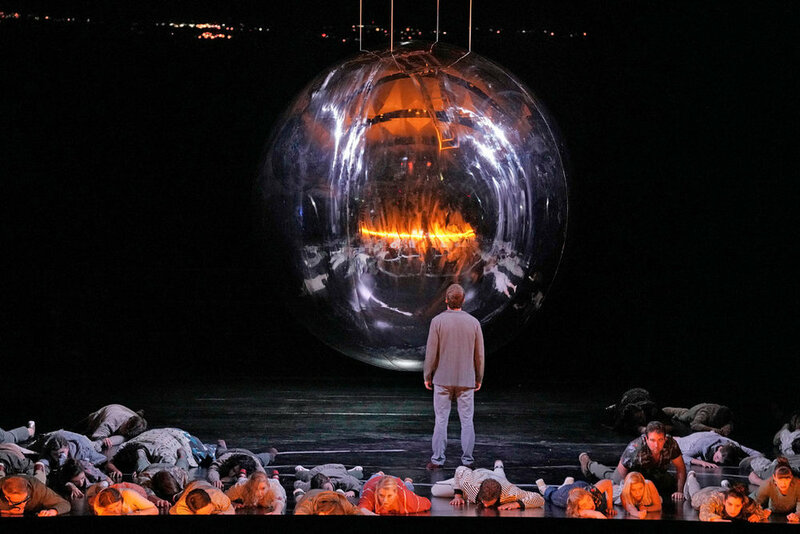 There’s almost no set except a gigantic silver sphere hanging a few feet above the stage. Bomb, globe, Christmas tree ornament, disco ball: Its surface shined to a mirror, this orb can be anything you project onto it. Mr. Sellars has been at pains to flesh out the opera’s rather sketchy connection to its setting. As much a community organizer and consciousness-raiser as a director, he has brought into the staging indigenous people from the region and a group of so-called downwinders, whose families lived not far from the test site and say they suffered health problems from the resulting radiation. Moving and palpably real, these interventions further pulled the opera from the naturalism of its early stagings, and felt of a piece with the terse weather reports and dense, dreamlike poetry — Donne, Baudelaire, Muriel Rukeyser, the Bhagavad Gita — in which the characters attempt to express themselves. To Mr. Sellars’s credit, the involvement of these local communities is stirring but not exactly uplifting. It was presumably unintentional, but telling, that the solemn preperformance Corn Dance, a ritual rarely given outside the dancers’ pueblos, took place as much of the audience noisily took its seats, air-kissed, and chatted: thousands of rich white people, ignoring the indigenous as they always have. The work is, frankly, less boring than I remembered — those weather reports feel tighter here than at the Met — though the passionately precise new recording is also a revelation in this regard. With so much pared away in the staging, the weird intensity of the libretto’s poetry is stronger and less jarring, its tumble of eroticism and morbidity more evocative; the sense that the bomb has contaminated these characters and their relationships is more explicit. Mr. Adams’s score now comes across as a steady knotting of the stomach, gradually ratcheting tension by alternating lush, ominous sensuality and pummeling intensity. And it is well served by the conductor Matthew Aucoin — his orchestra committed, if less rivetingly rigorous than the recording’s — and an excellent cast. While Ryan McKinny’s extremes aren’t as epic as those of Gerald Finley, who originated the role with a uniquely wounded authority, he is a handsomely frustrated Oppie. 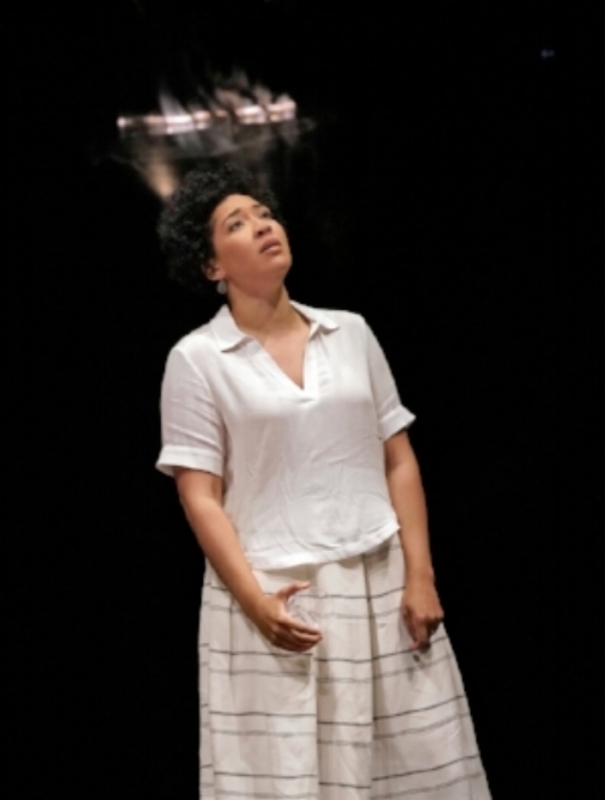 Julia Bullock, her voice warm and her presence daringly prickly, is a richly complex Kitty Oppenheimer. Mr. Bliss, Andrew Harris, Daniel Okulitch and Meredith Arwady make vigorous impressions in smaller roles; the Santa Fe chorus, drawn from the company’s young artist program and directed by Susanne Sheston, is as always a wonder. Yet a certain emptiness remains at the work’s core. “Doctor Atomic” was commissioned as an American “Faust,” but the opera’s Oppie, who’s never as thrilled about the bomb as the man himself was, doesn’t get to revel in Faust-like triumph. And our sense that he’s surrendered his integrity for personal gain is, as the critic Daniel Mendelsohn wrote in 2009, contingent on particular assumptions — debatable, at least — about the morality of the bomb. Nor is this Oppenheimer the Prometheus figure he styled himself in real life. To revive that legend, of a life-giver punished for his hubris, the opera would have needed to push into the decades beyond World War II, into Oppenheimer’s outspoken, complicated regrets and the disgrace of the stripping of his security clearance. “Doctor Atomic” embraces one thing opera does do well: spectacle. (There’s the disco-ball bomb, everyone dancing beneath it.) But focusing entirely on “will it explode?” — the only real question of the long second act — stints the human, the deeper work opera can do. Now a teenager, “Doctor Atomic” still conveys a feeling of grief — here in Santa Fe a very local variety — rather than telling a story. 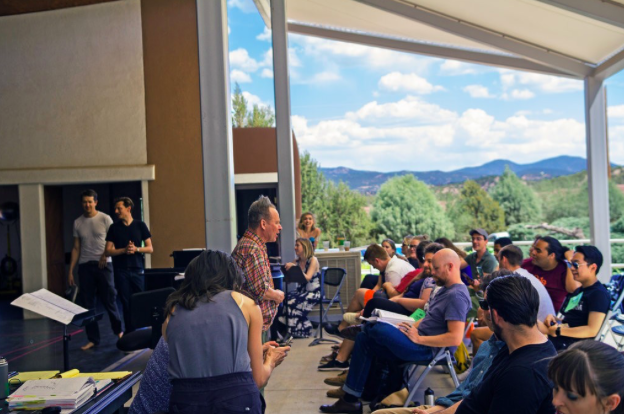 SANTA FE — The lights of Los Alamos, the birthplace of the atomic bomb, can be seen at night from the idyllic open-air theater of Santa Fe Opera. So around here, John Adams and Peter Sellars’s “Doctor Atomic,” about the bomb and its creators, is not just a meditation on the invention of a weapon that changed the world. It is also very much a local story — a complicated one. “One of the most powerful things about doing ‘Doctor Atomic’ here is to make a history from New Mexico,” said Mr. Sellars, who assembled the opera’s libretto from historical sources, directed its premiere in 2005 and is rethinking aspects of it for the new Santa Fe production he is creating, which opens on July 14 and runs through Aug. 16. Other operas have been staged at or near the locales where they are set; Plácido Domingo once starred in a television production of Puccini’s “Tosca” that was filmed live at the locations in Rome where the action takes place. But the Napoleonic wars that serve as the backdrop of “Tosca” are nowhere near as hotly debated as the creation of the atomic bomb, and the decision to use it on Japan at the end of World War II. The bomb is never far from the conversation here. Los Alamos remains the home of a national laboratory that still works on the nation’s nuclear weapons. The success of the Manhattan Project — in which the polymathic physicist J. Robert Oppenheimer was tapped by the no-nonsense Army Gen. Leslie Groves to run a secret laboratory to race Nazi Germany in creating an atomic weapon — is still locally celebrated. A statue of Oppenheimer and Groves stands outside Fuller Lodge, at the former boys’ school where the scientists gathered during the war. Gift shops sell cocktail glasses with Oppenheimer’s silhouette and his martini recipe painted on the outside (“4 ounces good gin, a smidge of dry vermouth, lime juice and honey syrup”). One of the streets, Trinity Drive, is named after the Trinity test, when the world’s first atomic bomb exploded in 1945, some 200 miles to the south. A picnic late last monthcelebrated the 75th anniversary of the lab’s founding. The director of Los Alamos National Laboratory, Dr. Terry Wallace, is a second-generation Los Alamos scientist who said that when he was growing up there, his Boy Scout troop would collect depleted uranium, something that would be unimaginable today. He expressed concern that the opera, which portrays the creation of the bomb as a tragedy, risked simplifying a complex moral calculus. Elsewhere in New Mexico, the state’s atomic legacy is viewed differently. As opera rehearsals were underway in Santa Fe last month, Tina Cordova, 58, a small-business owner who lives in Albuquerque, was in Washington testifying before the Senate. She was part of a group seeking compensation from the government for damage she contends was caused by the Trinity test, which was so powerful that it melted the sand into a glasslike substance eventually named trinitite. “The government has always characterized the area as remote and uninhabited, but we know from the census data that there were thousands of people living in a 50-mile radius of the test site,” Ms. Cordova, a founder of the Tularosa Basin Downwinders Consortium, testified. One of those people, she said, was her father, who was a 4-year-old living in Tularosa, about 40 miles from the Trinity site, when the bomb exploded. He died many years later of cancer. Mr. Sellars said that he planned to cast downwinders in his new production. Some will stand as silent witnesses in a scene in which General Groves explains that, to maintain secrecy, he will not send evacuation forces into nearby areas. (A medical officer tells him: “Sir, no cure has yet been found for the agonies that result from overexposure to fallout and radiation.”) Downwinders light candles each year to commemorate those who died of cancer; Mr. Sellars hopes to incorporate that ceremony into the opera as well. 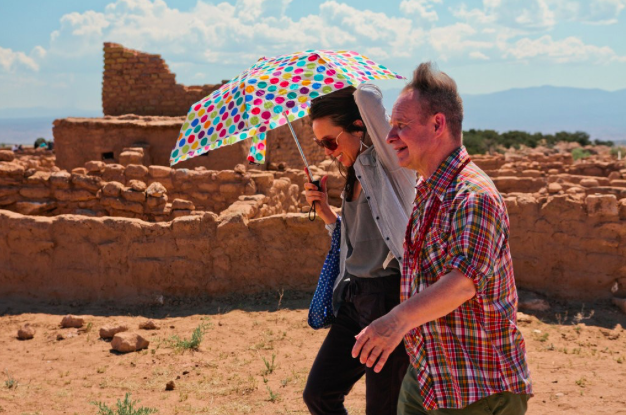 One morning last week, he and the opera’s choreographer, Emily Johnson, took a break from rehearsals to visit the Puye Cliff Dwellings, the centuries-old remains of a Native American settlement on the Santa Clara Pueblo, a short drive from Los Alamos. Mr. Sellars said that his new production would not labor to recreate the war era through its sets and costumes, as his earlier one did. Even the bomb itself — called “the gadget” by the scientists who built it — will be a reflective sphere rather than a facsimile of the real one; Mr. Sellars wants it to represent all nuclear weapons, not just the prototype. “My grandparents always told me that Native Americans are the caretakers of this earth,” Ms. Harvier said shortly before she descended into a round kiva, or ritual room, with Mr. Sellars and looked at the dried remains of what had once been the pueblo’s reservoir. There will be a contingent in the audience from Los Alamos. Heather McClenahan, the executive director of the Los Alamos Historical Society — which operates a museum that gives a sense of what life was like in a lab so secret that the babies who were born there had their addresses listed as “P.O. Box 1663, Santa Fe” on their birth certificates — said that a group planned to attend the opera and discuss it afterward at UnQuarked, a local wine bar. J. Arthur Freed, a former librarian at the lab, plans to go, as well. Which is not exactly surprising: He is something of a “Doctor Atomic” groupie and has seen staged productions by 11 opera companies in seven countries. Mr. Freed, a member of the J. Robert Oppenheimer Memorial Committee, formed to commemorate Oppenheimer, said that he viewed the work as historical fiction, but found it rewarding. Ms. Cordova, who testified in front of Congress, said in a telephone interview that she was intrigued by the prospect that “Doctor Atomic” might bring together people with different points of view about the bomb.